"If I had known how easy it is to install and implement MyAssistant we would have purchased it earlier." 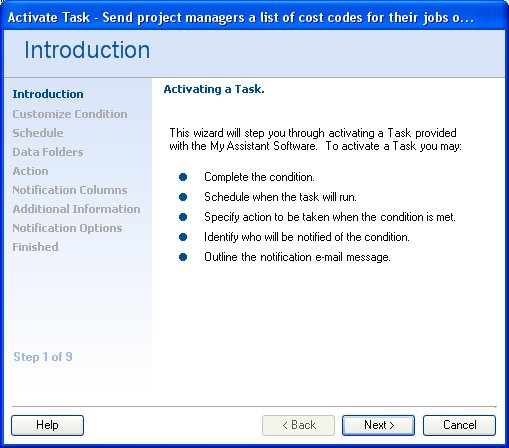 MyAssistant consists of Tasks and Notifications. Tasks define the action MyAssistant will take—what it will check for and when, the information it will communicate, and who will receive notifications. Click the following links for a list of the construction and real estate Tasks that come with MyAssistant. You can modify any of these Tasks or create your own. 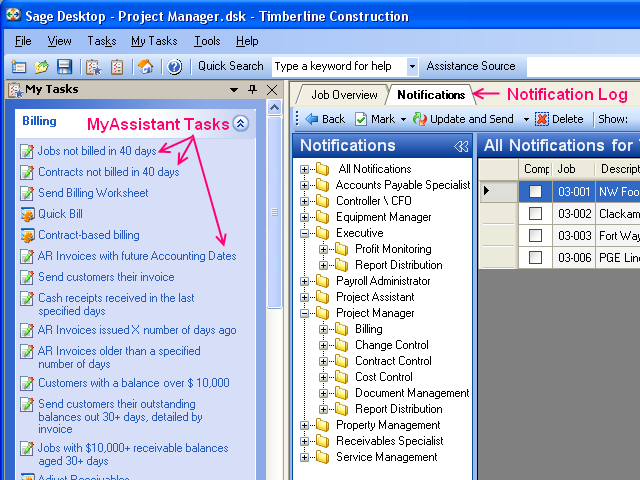 Notifications are the results generated when a MyAssistant Task runs, such as a past due customers needing attention. Tasks are activated by stepping through a simple Wizard. Each MyAssistant Task contains a ‘condition’ – much like a Timberline Office report condition – that defines what MyAssistant will monitor. Over 330 pre-configured conditions come with MyAssistant, and each can be easily modified. 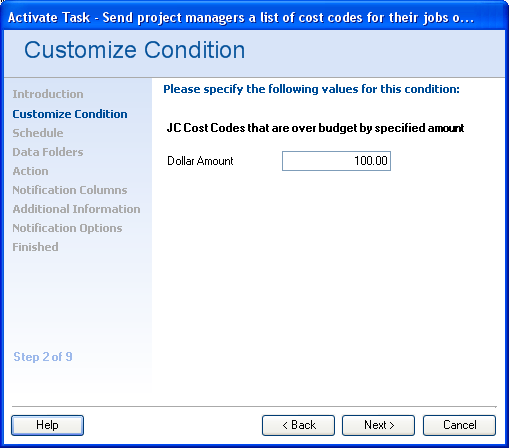 If a condition has a parameter, such as the number of days to look ahead to see if an invoice discount is expiring, that value is entered in the first step of the Wizard. Next, set the Task’s schedule. MyAssistant Tasks can be scheduled to automatically run hourly, daily, weekly, every Monday at 5:00 a.m.—any regular schedule can be accommodated. 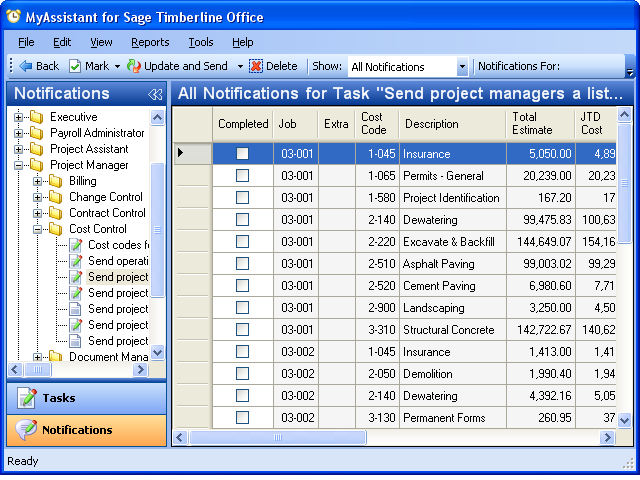 You can even set Tasks to run every hour during regular business hours. After the schedule is set, tell MyAssistant how to communicate. 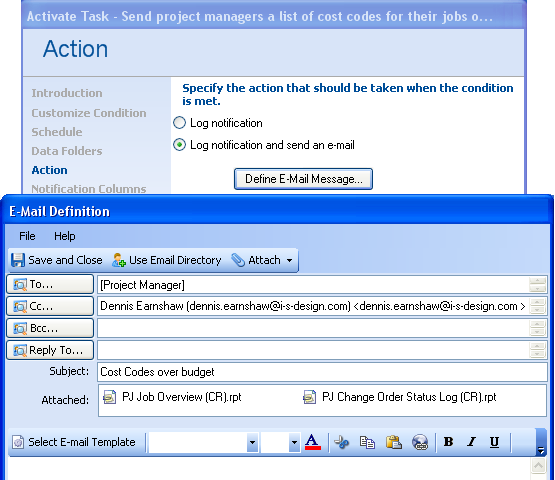 If sending an email, address the email using contacts from your Outlook Address Book. You can also use MyAssistant Email Directories to send each project manager, property manager, vendor, employee, customer, tenant, and others a separate email with just their information. Email Directories do not require you to enter email addresses in Timberline Office, but they can use any email address you already store in Timberline, including in the Address Book. MyAssistant can send reports, letters, links to documents—any file or link can be attached or included in an email. 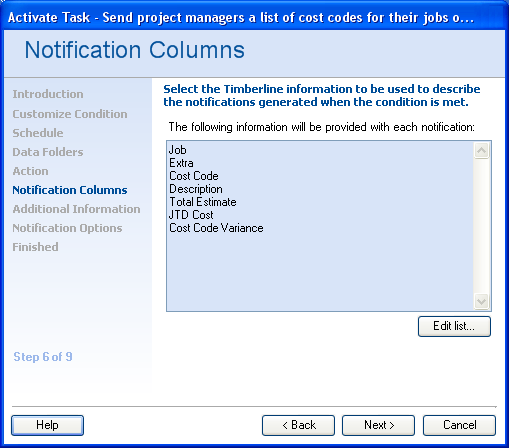 To complete the Wizard, tell MyAssistant what, if any, data from Timberline will be included in the email message and Notification Log. Prebuilt Tasks have the information to communicate for each Task already defined, and you can add or remove information for any Task. Once the Wizard is finished your MyAssistant Task is active, generating notifications to the people you want on the schedule you set. In addition to email messages, MyAssistant provides each user with a log of their notifications. The Notification Log allows notification recipients to view and manage all the information generated for them by MyAssistant in a single place. 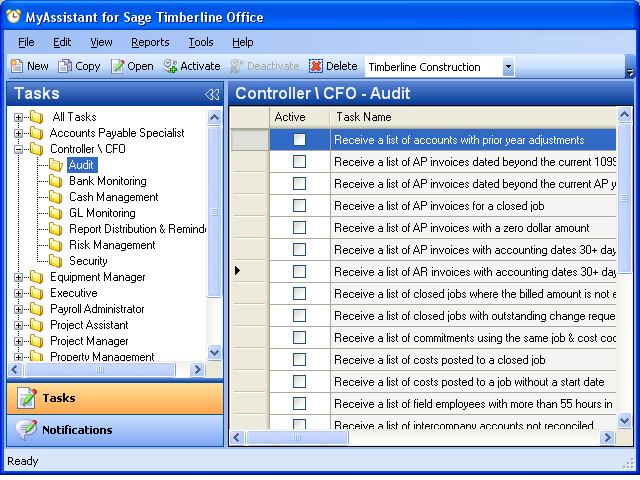 MyAssistant is fully integrated into the Sage Desktop. Add MyAssistant Tasks directly to your Desktop configurations, and access your Notification Log. Terri Sobeck, Director of Administration for Stevens Construction: "MyAssistant has been very simple to get up and running. 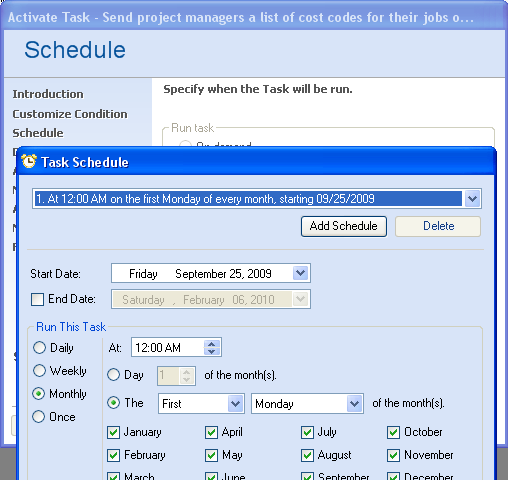 Changing some of the Tasks as well as a Task’s schedule is really easy. I’m the one that sets everything up—I set up who to alert and when, and define what information gets to the staff. It’s very user friendly." "This is a great product that gives you timely information, proactively."